Notes: Includes both full and partial benefit enrollees. Long-term care services include fee-for-service spending for institutional services (nursing facilities, ICF/IDD, ICF/IMD) and HCBS (home health, personal care, and HCBS waivers). 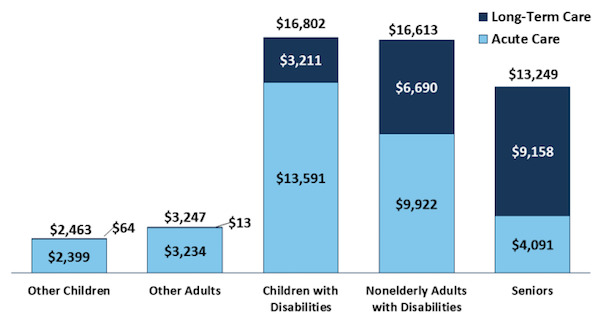 Data Source: KFF/Urban Institute estimates based on data from FY 2011 MSIS and CMS-64 reports. MSIS FY 2010 data were used for states missing 2011 data. This entry was posted in Data Watch on May 10, 2017 by Genevra Pittman.